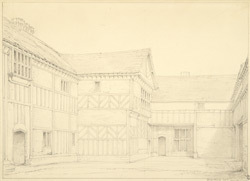 This pencil drawing depicts the interior courtyard of Wardley Hall, near Salford. Although there are written records of Wardley found in the Domesday Book, the present building dates from the 16th century. Constructed of timber and brick, the facade of the house is dominated by an unusually tall central chimney. Wardley Hall is alternatively known as the "House of the Skull", on account of the remains of a Catholic martyr, St. Ambrose Barlow, found encased in a glass cabinet on the premises. The house underwent major restoration in the 19th century and is currently the home of the Bishop of Salford.